Sessions run during the morning from 9 am until 12 pm. On the hour these are made up of mixed ages and ability. 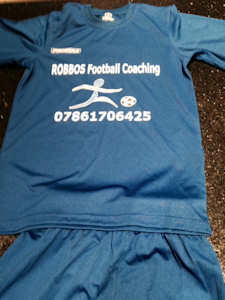 These sessions are normally outside however from time to time we have the option of using the gym in adverse weather conditions. 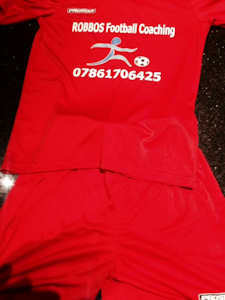 The cost of the 1st session is £5.00. Thereafter £20 is payable in full every 4 weeks please see calendar for dates due. We now have to maintain a strict policy regarding this in order to secure your child's place this payment must be made if you do not then your child's place will be allocated to those currently on the waiting list. Please ensure your child is dressed in appropriate clothing & footwear. 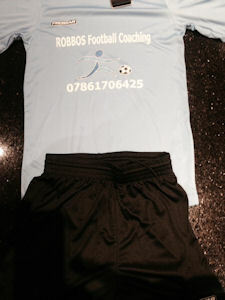 Kits are available in 3 sizes & colours for you to purchase as a cost of £20 all embellished with the ROBBOs logo.